A Vinter’s Job is Neverending! There always seems to be a sense of relief once the first hard frost comes that knocks our grape leaves to the ground. 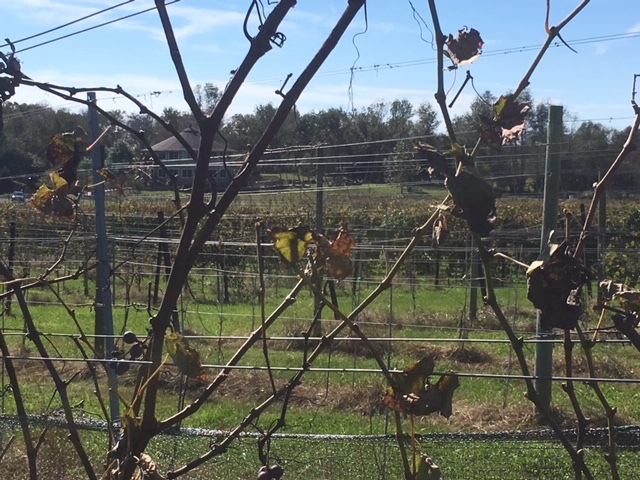 The high priority of tending to those vines over the past seven months drops like the leaves themselves. The fruit has long been in the cellar and our priorities shift to the neglected areas from earlier in the season. I guess it would be like a fishing boat coming into port once the season has ended. The focus of the captain shifts to repairs, maintenance and recharging for the next season. And every great captain knows how important it is that his or her team understands the change in priorities. The work does not stop. In some ways it’s harder than the middle of the season as there is more planning involved so your team has the knowledge, direction and tools to get these other projects done – this will make a big difference later on. It’s nice when guests compliment me on how good the property looks. I always have an eye on the dozens of undone projects, cleanups and fixes that I have not had time to address. We have about a month or so to focus on grass repairs, painting, deep outside cleaning and other projects that we want to get off the list. We try to address the most important ones based on weather timing, impact to the business, safety and sometimes cost. I always have a list of things to do that is much larger than the day. Going back to the team and their skill sets, we have always worked to employ our vineyard team through the year by teaching them skills that will be productive in the off season. Jim Law of Linden Vineyards speaks of painting fences and building stone walls as a vineyard tool in order to keep his crew working and coming back to work the next season. An experienced vineyard worker is very valuable in the growing season. By training them in other trade skills, they have value the rest of the year as well. I continue to preach this concept to the workers as well as the new vineyard owners. It is always important that the mangers plan some off season work for the crew so they can keep food on their table all year as well as keep from joining the many other industries looking for hard working labor. With the New Ag School, we have been creating modules of introductory training focusing on all of the different jobs to be done in an agricultural operation like ours. Good mentoring in a hands on environment is critical in learning these skills, but the written base helps keep folks safe, on target and learning in a fashion they know. We should never stop learning and making a farm operation successful always gives us the opportunity to just that. Farming certainly keeps us humble as well as grounded.